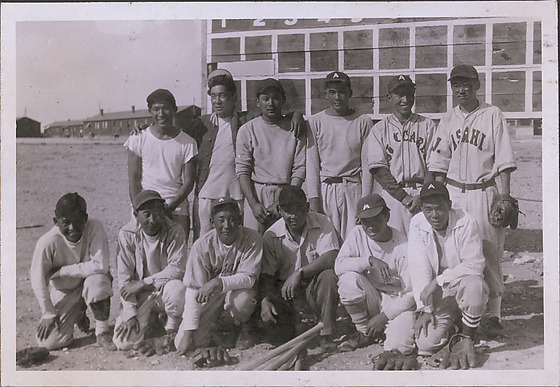 Portrait of a baseball team in front of scoreboard at Heart Mountain concentration camp, Wyoming, 1944. 12 young men pose in two rows with baseball bats and baseball gloves on the ground in front of them. All wear baseball caps, some have letter "A". 3 players wear uniforms, 2 on the far right back row and third from left in front row. Gloved player's jersey reads "ASAHI." Barracks are visible in background, left, across open field.